Here you can learn about doTERRA douglas fir essential oil uses with recipes. I explain all about douglas fir and all the ways you can use it and how to use it. Because Douglas Fir trees are often used in the Christmas tree industry, the aroma of Douglas Fir has many uses around the holidays. You can create your own holiday room spray, and invite the smells of the season into your home. 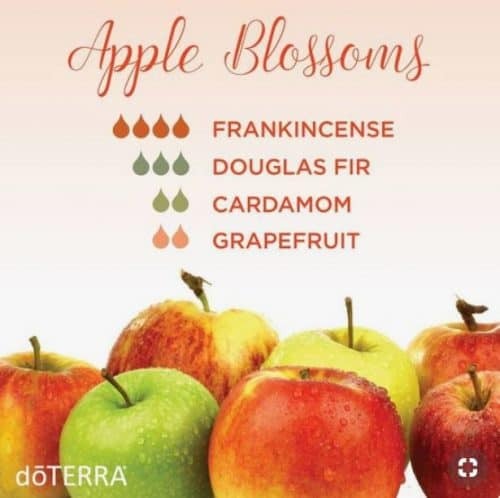 Simply combine 15 drops of Frankincense, 15 drops of Grapefruit, and 30 drops of Douglas Fir into a glass spray bottle. Top with water and spray! Many people use Douglas Fir oil for skin because it holds cleaning and purifying properties when applied topically. Due to its chemical makeup, Douglas Fir is very useful for cleaning—whether you are wiping down counters or purifying your skin when you wash your face in the morning. To enjoy the benefits of Douglas Fir oil for your skin, add a few drops of the oil to your facial moisturizer to help cleanse and purify the skin. With a combination of citrus and wood notes, Douglas Fir oil’s aroma can help promote an uplifting and positive environment. When you want to create a positive mood at home, at the office, or in a child’s bedroom, diffuse a few drops of Douglas Fir. Because of its unique chemistry, Douglas Fir oil blends well with citrus, wood, and spice essential oils. 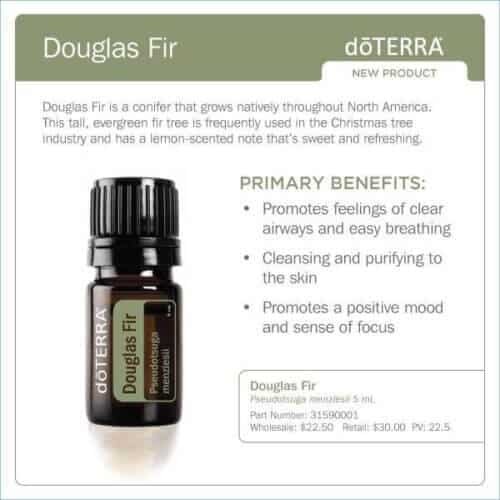 Along with creating a positive mood, diffusing Douglas Fir oil will also freshen and purify the air—an added bonus! Bring an invigorating aroma to your daily hygiene routine by adding a few drops of Douglas Fir to your favorite cleansers and soaps. Add one drop of Douglas Fir oil to your facial cleanser, and enjoy the purifying and cleansing properties this oil has to offer. Before you get in the shower, add a drop or two of Douglas Fir oil to bar soap or body wash to experience added cleansing benefits with a refreshing aroma. 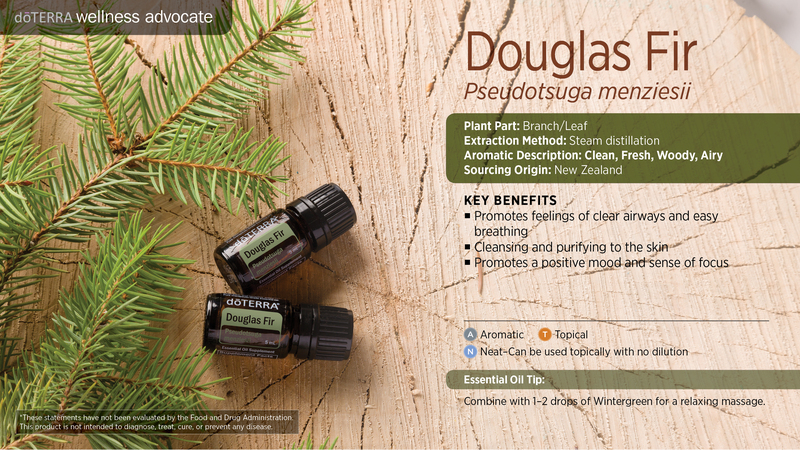 For a relaxing, cooling massage experience, consider combining Douglas Fir with one or two drops of Wintergreen. Remember, doTERRA Fractionated Coconut Oil makes a great carrier oil for massages because it is safe and high quality. Diluting oils with Fractionated Coconut Oil can help you avoid skin sensitivity, particularly when using oils that are especially potent. Want an invigorating diffuser blend that will uplift your mood and help you focus? 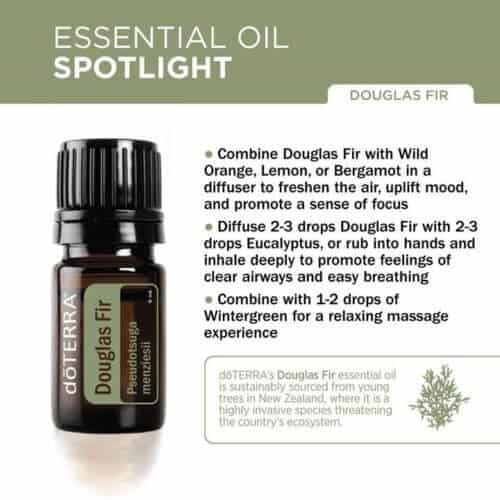 Combine Douglas Fir, Wild Orange, and Lemon or Bergamot in your diffuser for a blend that will freshen the air, uplift the mood, and promote a sense of focus. Need extra help focusing? 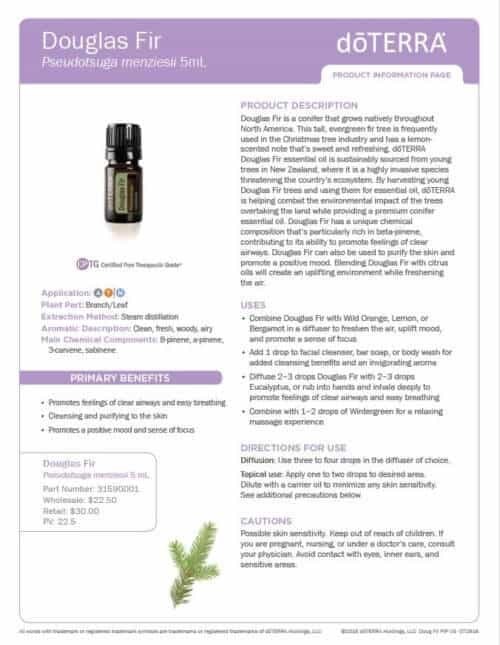 Inhale Douglas Fir oil directly from the bottle. Find your inner joy with this delightfully bright blend. Bergamot, Douglas Fir, and Lemon will liven up your home. Because everyone loves picnicking in the mountains but can’t do it every day, we created this diffuser blend. Douglas Fir lends apple-y sweetness to the refreshing and balancing scents of Eucalyptus, White Fir, and doTERRA Balance®. When you feel like you need to chin up, cheer up, or charge up for the day, the Cheer Up Charlie diffuser blend is ready to lift your spirits. 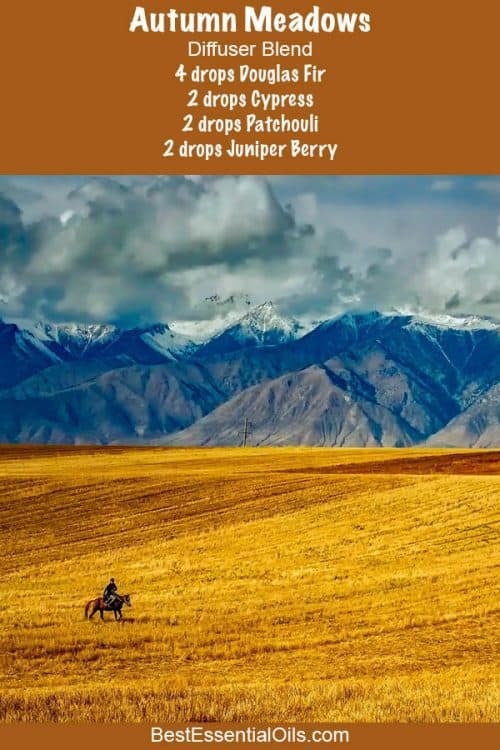 This invigorating blend promotes a positive mood and sense of focus with its stimulating and refreshing properties while promoting emotional balance and well-being. Diffusing the Pine Pathways blend is like walking along the fragrant, wooded trail of a peaceful forest. As Douglas Fir, Arborvitae, and Spearmint come together, it will enliven your senses, transporting you to a quiet, secluded mountainside. According to yogic practice, “Prana” is Breath or vital energy in the body. On subtle levels, prana represents the pranic energy responsible for life or life force, and “ayama” means control. So Pranayama is “Control of Breath”. Juniper Berry and Grapefruit give a fresh, subtly sweet scent which is soothing and commanding at the same time. 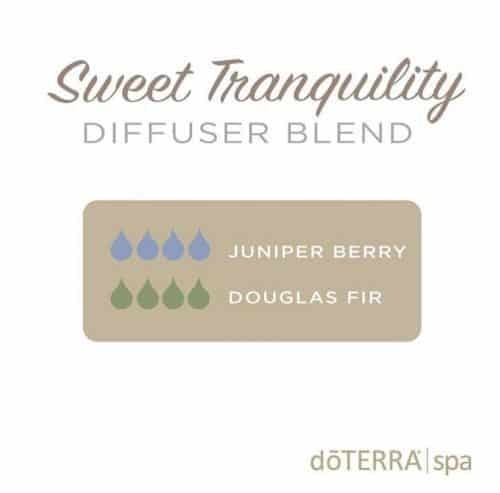 Diffuse this blend anytime you feel a need for a sense of quiet strength and renewal.